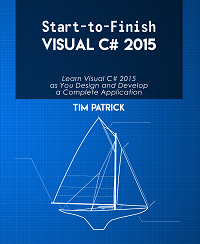 Start-to-Finish Visual C# 2015 exists to teach you how to write complete software applications using Visual C#. You'll learn all about the C# language and .NET Framework features, the bits and pieces of syntax and logic that go into code development. But the goal is a usable software solution, and you'll find just that in each chapter, and in the accompanying Visual Studio software projects. As the text guides you through initial design to final deployment, you'll discover the tools and skills needed to create a working software product. Whether you're new to programming, or want to add C# to your existing skillset, Start-to-Finish Visual C# 2015 will guide you step-by-step through the learning process. This great Visual C# 2015 learning tool is now available for purchase in paperback and ebook formats. Buy the paperback edition from Amazon.com, its other international sites (such as Amazon.co.uk), or CreateSpace. Or visit your favorite online bookseller. Buy the ebook edition from Amazon Kindle, Apple iBooks, Barnes & Noble Nook, Kobo, or Inktera. Acccess the book through your Scribd subscription. Use the following link to download and install the sample source code for the book. The download is a standard Windows executable. Run the downloaded file to install the book's files to the target directory of your choice. Note: If your local Windows permissions do not allow you to run executables downloaded from the internet, use the following link to download a standard ZIP archive file instead. Once downloaded, you can manually extract the contents into any folder you choose. After running the installation program or manually extracting the contents of the archive, follow the instructions in Appendix A of the book to install the project templates and the code snippets. The Library Project designed in Start-to-Finish Visual C# 2015 uses a barcode font supplied by you to print barcode labels. The following is a list of some resources you can use to locate a barcode font. Contact Tim Patrick by email at tim@timaki.com. Copyright (c) 2019 by Owani Press. Site Information.